Two years after his Bharatiya Janata Party (BJP) swept to power in Lok Sabha elections, Prime Minister Narendra Modi continues to enjoy overwhelming public support. Roughly eight-in-ten Indians (81%) have a favorable view of Modi, including 57% who express a very favorable opinion. Just 16% voice an unfavorable assessment of the former chief minister of Gujarat state. This backing has decreased slightly from the 87% of Indians who voiced a favorable opinion of Modi in 2015. But the intensity of such views has waned somewhat: The share of Indians with a very favorable view of Modi is down 11 percentage points in the last year. Given his strong overall support, it is not surprising that Modi is popular across demographic groups – to both men and women, and among all age groups, educational backgrounds and income levels. As might be expected, 94% of BJP followers support the leader of their party. He is also seen favorably by 61% of Congress party adherents. However, partisan differences in views of Modi can be seen in the intensity of such support: 82% of BJP supporters have a very favorable view of the prime minister, while just 24% of Congress backers voice a very positive opinion. Modi is seen very favorably by seven-in-ten of those with some college education or more and by more than half (54%) of those with a primary school education or less. Notably, despite the Congress party’s traditional strength in rural areas, Indians in cities and the countryside have a similarly positive assessment of the prime minister. Rahul Gandhi, Congress party standard bearer in the 2014 election, grandson of Prime Minister Indira Gandhi and son of former Prime Minister Rajiv Gandhi, is seen favorably by 63% of the public, unchanged from last year but up from 50% in 2013. Fully 85% of Congress party supporters voice a positive view of Gandhi, but he has only a 52% backing from BJP adherents. Roughly two-thirds (65%) of those with a primary school education or less back Gandhi, while about half (49%) of those with some college or more support him. Rahul’s mother, Sonia Gandhi, the long-serving president of the Congress party, is viewed favorably by 65% of the public. This positive view is up from 58% in 2015 and 49% in 2013, suggesting that the public’s view of her is steadily improving in parallel with views of her son. Opinions about Sonia Gandhi are similarly partisan: Approval is 88% among Congress party adherents and 52% among BJP supporters. And, just like her son, she enjoys stronger support among those with a primary education or less than from those with some college education or more. Arvind Kejriwal, the chief minister of Delhi, is viewed favorably by 50% of the public, down from 60% in 2015. The head of the anti-corruption Aam Aadmi Party (the party’s name translates as “common man”) is viewed favorably by 62% of Indians with at least some college and 44% of those with a primary school education or less. However, only 5% of those with some college or more respond “don’t know” to this question, compared with 30% of those who have a primary education or less. Public views of the BJP, Prime Minister Modi’s party, mirror opinion about their leader. Eight-in-ten Indians voice a positive assessment of the BJP, including 53% who have a very favorable opinion. Total support for the BJP is down slightly from last year (87%). And the intensity of that backing has waned: Very favorable views are 53% in 2016, down from 65% in 2015. Not surprisingly, the party’s most fervent backers are BJP adherents (94%), but 60% of Congress party supporters also voice a positive view of the BJP. The party enjoys roughly equal support in cities and in the countryside. Notably, however, very favorable assessment of the BJP in rural areas has fallen from 70% in 2015 to 54% in 2016. At the same time, support in cities is largely unchanged. BJP favorability is fairly strong across the country: It is highest (86%) in the eastern states of Bihar, Jharkhand, Odisha and West Bengal, and lowest (71%) in the western states of Chhattisgarh, Gujarat and Maharashtra. Two-thirds of Indians have a favorable opinion of the Congress party, up slightly from support in 2015 (61%). While only 28% of the public has a very favorable view, this is up from 16% last year. Again there is a deep partisan divide in public views: 90% of Congress supporters give their party a positive assessment, but only 56% of BJP backers agree. The highest Congress approval is in the southern states of Andhra Pradesh, Karnataka and Tamil Nadu. Its lowest backing is in the western states. 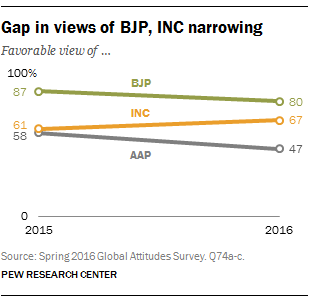 The AAP enjoys relatively less approval than either the BJP or the Congress party and that favorability is declining. Less than half (47%) of the public voices a positive assessment of the AAP, down from 58% in 2015. Reflecting the regional strength of the party, its support is highest in northern states – Haryana, Madhya Pradesh, Punjab, Rajasthan and Uttar Pradesh – and Aam Aadmi-governed Delhi (57%), and lowest in western states (23%). Modi’s overall public support is higher than people’s opinions of his specific character attributes. A majority (56%) of Indians believe Modi is “someone who cares about people like me.” Men (61%) more than women (50%) say Modi understands their situation, as do those ages 18 to 34 (59%) more than those age 50 and older (51%). Not surprisingly, Indians who identify with Modi’s own party (68%) see him as more sensitive to their needs than Congress party supporters (37%). About half (51%) of the Indian public believes that Modi is someone who stands up for what he believes, while 28% say he is not. About six-in-ten (62%) BJP supporters see the prime minister in this light, but only four-in-ten Congress backers agree. 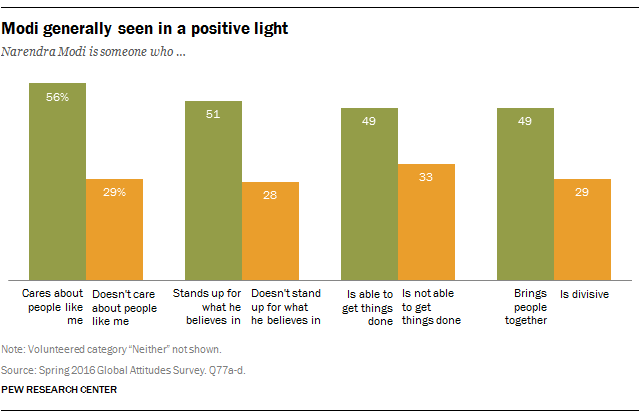 Roughly half (49%) of the public views Modi as someone who is able to gets things done. A third says he cannot accomplish things. Again there is a partisan divide in how people see the prime minister’s effectiveness: BJP supporters (61%) are more likely than Congress adherents (41%) to judge Modi as a can-do prime minister. And 49% of Indians say Modi brings people together, while 29% believe he is divisive. While Indians generally approve of Modi’s handling of various problems facing the country, such assessments have grown more partisan in the last year. The Indian labor force is growing more quickly than the number of jobs being created by the formal economy. About six-in-ten (62%) Indians approve of Modi’s handling of unemployment. More than seven-in-ten (73%) BJP supporters approve of his endeavors, largely unchanged from the number who voiced such approval last year. But among Congress party backers, support for his efforts to deal with unemployment has fallen sharply, from 62% in 2015 to 45% in 2016. A similar proportion of the overall public (62%) approves of the prime minister’s efforts to help the poor, a perception that is little changed overall from 2015. Yet there is a widening partisan divide in this assessment: 73% of BJP adherents favor Modi’s efforts, while just 46% of Congress supporters agree. The partisan gap, now 27 percentage points, was only 6 points last year. Likewise, about six-in-ten overall (61%) approve of Modi’s handling of terrorism. Support among those who identify with the BJP is 71%, unchanged from 2015. Backing by Congress adherents is 46%. A roughly comparable segment of the Indian public as a whole (59%) voices support for the prime minister’s handling of corruption. BJP adherents are more supportive (73%) than Congress backers (38%). Notably, Modi’s support on this issue is up by 8 points among his own party faithful and down by 18 points among Congress party supporters. More than half (53%) of the public approves of Modi’s efforts in dealing with air pollution. Despite very poor air quality in many of India’s major cities, there is no difference in the judgment of Modi’s performance between those living in urban or rural areas. Nor is there any gender or age gap in such assessments. But there is a 23-percentage-point difference by party: 62% of BJP supporters but only 39% of Congress adherents approve of Modi’s performance. In both 2015 and 2016, Modi’s lowest approval rating (53%) was for his handling of communal relations. This is a partisan assessment, with his own party (65%) more supportive than the opposition (40%). And public polarization on this issue has grown. It was 10 points in 2015; it is now 25 points, with approval among the BJP growing. As with Modi’s overall favorability and the public’s judgment of his character, views of his handling of some national problems differ by the education of the respondent. Those who have some college education or more are significantly more likely than those with a primary education or less to approve of Modi’s performance on several issues. This education gap is 24 points on helping the poor, 22 points on dealing with corruption and 18 points on handling joblessness. Modi fares less well in public assessment of his handling of relations with other countries, despite having taken 51 trips to 42 nations since he became prime minister in 2014. The prime minister has made four trips to the United States since taking office. More than half (54%) of Indians approve of Modi’s dealings with Washington. Just 15% disapprove. But roughly three-in-ten (31%) voice no opinion. Notably, public approval of Modi’s handling of America is down 12 percentage points since 2015 despite his having visited the U.S. more than any other country during his premiership. More than four-in-ten Indians (43%) approve of Modi’s relationship with Russia, while 25% disapprove. But 32% say they “don’t know.” Support for the prime minister’s dealings with Moscow is up 6 points since 2015. About four-in-ten (38%) back Modi’s handling of ties with China. Roughly three-in-ten (32%) disapprove, while 30% express no opinion. Such sentiment is largely unchanged from last year. Just 22% of the public approves of Modi’s management of India’s volatile relationship with Pakistan. Half disapprove. This harsh judgment is relatively unchanged from 2015. In the handling of China, supporters of Modi’s own party, the BJP, are more likely than adherents of the Congress party to favor his conduct of bilateral relations. Notably, however, more than half of BJP supporters (54%) and a plurality of Congress party adherents (45%) disapprove of the prime minister’s handling of relations with Pakistan. However, the proportion of Indians responding “don’t know” is higher among Congress supporters (35%) than among BJP adherents (23%).